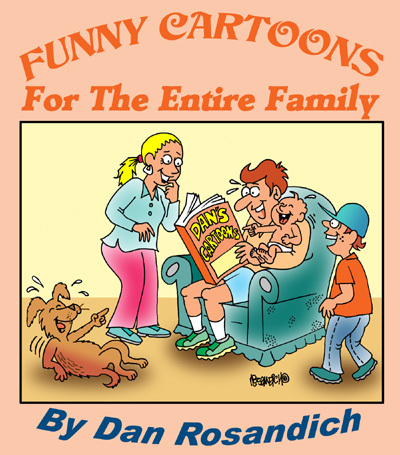 Office furniture cartoon humor featuring desk cartoons can be found throughout my catalog offered here. Whether it’s an article you’re writing about desks for the office or if you’re blogging about desks and furniture for your work space, I offer various cartoons for your review. 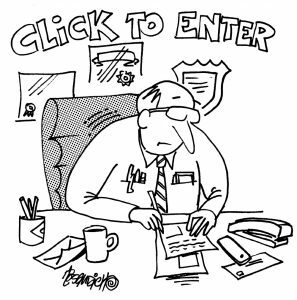 Perhaps it’s a print ad promoting the work cubicle and you want some light-hearted humor to add some comical flavor then take time to browse my cartoons. Funny cartoons about work in the office have always been a favorite part of my output. Cartoons depicting workers with cluttered desks are readily available. You might be looking for the type of humor that depicts a cartoon student desk with the student sitting intently talking to a teacher, and that sounds difficult to find. Not in my collection! Some examples of how crazy my desk cartoons can be….how about an office worker standing along side his desk and complaining about his new office “chair” which some smart alec replaced….with a toilet! There are desks with name plates on top of the desk and even exhausted office workers sleeping on top of their desks! These are just a few examples of what you can expect to find when looking throughout my collection! As with any images I offer you, they can be colorized or re-drawn to your needs so they fit the project you’re working on. No matter what the specific usage, I can accommodate you. Contact me using my form or use my business email address on the contact page. Thank you!